In Flack this week: Chanel buys ad to instruct journos on style, Golin chiefs' radical training, and which creative agency has admitted being behind the Olympics 'Rule 40' Twitter hoax? ISN'T IT GOOD TO HAVE A SHOUTY BRAND? Well, the fashion house Chanel oops, sorry, CHANEL, thinks so. The company has taken adverts in journo trade title Press Gazette to insist that hacks always use capital letters when referring to its products, and to ask they avoid referring to products being 'Chanel-type' or 'Chanel-style'. Press Gazette and other titles apparently used to get even more of these brand defence adverts, including from similarly ubiquitous Hoover and Portaloo. Flack wonders whether CHANEL and Portaloo have ever gotten together to discuss the issues of how their brands have, as victims of their own success, passed into common parlance. A less likely pair of allies you'll have trouble finding, Flack suggests. Would you believe it? Dublin-based creative agency EightyTwenty has 'fessed up to being responsible for @Official_Rule 40, a parody Twitter bot who claimed to provide "automated alerts for infringement of Rio 2016 guidelines". 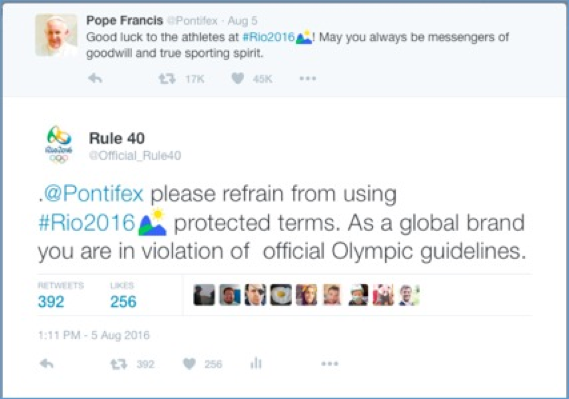 The fake #Riobot (@Official_Rule40) aimed to reply to anyone who used any Olympic-related terms or hashtags including #Rio2016, issuing a generic message warning them they were in violation of the guidelines. This included the likes of high-profile US Republican Ted Cruz, who, EightyTwenty said, deleted the tweet after receiving the notification. The Pope was also targeted. Twitter suspended the account within 24 hours, but the agency reckons tens of millions of people globally witnessed the hoax. EightyTwenty head of social and content Michael Corcoran, who is credited with the scheme, gloated: "This was by no means heavily planned and tactics were agile; I spotted an opportunity and I rode the wave. Social media at its best. "I fully expected to be shut down quickly – ironically I was infringing on International Olympic Committee copyright using the official logo while creating RioBot, but that was key to the execution at first glance to make it look authentic. "Rule 40 has caused frustration for many (including myself) working within the industry, facing missed opportunities for brands to activate around the Games. I always enjoy a creative challenge, but no mention of medals, podiums, sports, summer, any of the countries, teams or athletes has made it nigh on impossible to create compelling work." Flack wonders if Corcoran and his bot will be 'medalling' in any other sporting events. Rocky road for Golin trio? One interesting talking point recently has been Golin’s decision to restructure its most senior global team after CEO Fred Cook moves upstairs to take the chairman role at the end of the year. 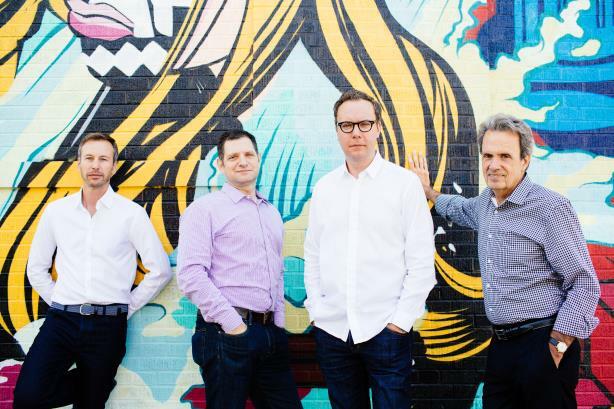 The new 'CEO+' model will see Jon Hughes, Gary Rudnick and Matt Neale (pictured left to right with Cook) share enhanced chief executive responsibilities. Anyway, Flack had the honour this week of being shown a T-shirt-soakingly funny Rocky-themed montage video featuring the trio training for their new positions. Sadly the video does not appear to have surfaced in the public domain – some shyness perhaps? Forget VR, is TR the next big thing for PR? With brands and agencies aplenty telling PRWeek about all the whizzy virtual reality experiences they are creating to lure wild millennials, PRWeek assumed it was in the VR vein that Liverpool FC sent a press release this week entitled 'Experience Anfield’s Main Stand ahead of first home game'. It turns out there was not a VR headset in sight – it was an opportunity for fans to come and have a look around. As in physically go to a tangible place that actually exists and look at it with their actual eyes and stand on it with their literal feet. Flack is calling this a tangible reality (TR) experience. It could be huge. Just don't try floating it down the Mersey. Talking of the beautiful game, and with football fever officially set to return from tomorrow (when the Premier season kicks off), Flack thinks the time is right to flag up this intriguing soccer spectacle. As part of its series of events to support New Generation – a charity that helps street children in Burundi – City PR agency Tulchan is hosting a five-a-side tournament featuring some very well known PR firms and media outlets. Confirmed teams so far for the ENGIE City Cup are: Bell Pottinger, Bloomberg, Brunswick, BuzzFeed, Cubitt, Edelman, Financial Times, Finsbury, FTI, The Guardian, Lansons, Maitland, MHP, Sky, The Times, Telegraph Media Group and Tulchan. Apparently The Times have won every such previous tournament, "and have already been bragging that they did so last time without conceding a goal", according to Flack’s source within the Tulchan dressing room. Coincidentally, PRWeek yesterday named its PR industry fantasy football team featuring big hitters from the sector, including senior figures from three of the PR agencies listed above. Let’s hope they will give the News UK newspaper team a run for their money. The City Cup is one of six events Tulchan is organising for New Generation – click here to make your donation. Flack can confirm it was very difficult to whittle down the team for PRWeek's industry fantasy football league to the starting 11 plus five substitutes – although, as the cliché goes, the depth of talent in the sector meant it was 'a nice problem to have'. One PR chief who unfortunately missed out was Peter Bowles, co-founder of Dynamo PR. His disappointment was palpable, as this tweet to PRWeek's deputy editor John Harrington shows.